Product Features Travel cup attaches to your blender base for quick blended drinks that are ready to go Blends a single serving of your favorite drink right in the travel cup Fits most Hamilton Beach blenders DuraBlend cup keeps contents cold and has a spill-free lid for easy travel Includes: Instruction Manual Capacity (volume): 12.0 Oz. Material: Plastic Care and Cleaning: Dishwasher-safe Dimensions: 7.6 " H x 3.9 " W x 3.9 " D Weight: 0.9 Lb. 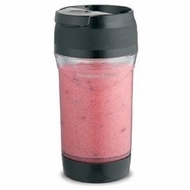 Warranty Description: 1 Year Limited Manufacturer Warranty The Hamilton Beach Stay or Go Travel Cup is a DuraBlend cup to keep drinks fresh and cold. It can be conveniently attached to the blender base to quickly blend drinks. The dishwasher-safe plastic cup also comes with a spill-free lid for easy travel so you can take your favorite drink on the go.